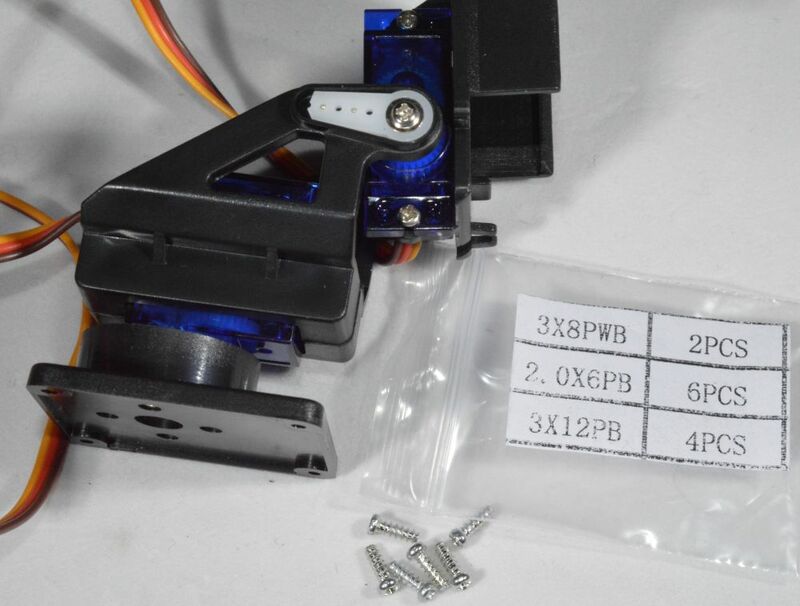 You should already have followed the instructions for assembling the chassis here. 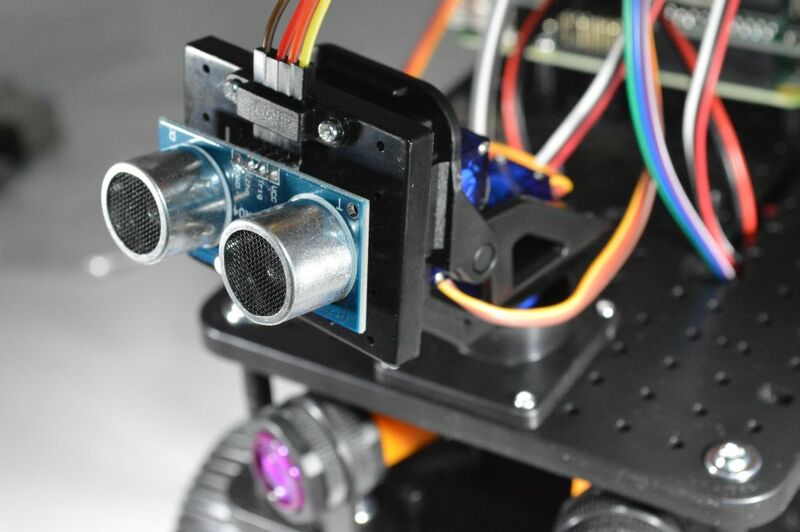 In this section we will add the RoboHAT controller, the obstacle sensors, line sensors and the pan/tilt assembly with ultrasonic sensor. 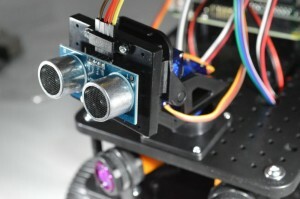 Screw one of the support pillars to the underneath of the RoboHAT at the front (under the RoboHat logo). 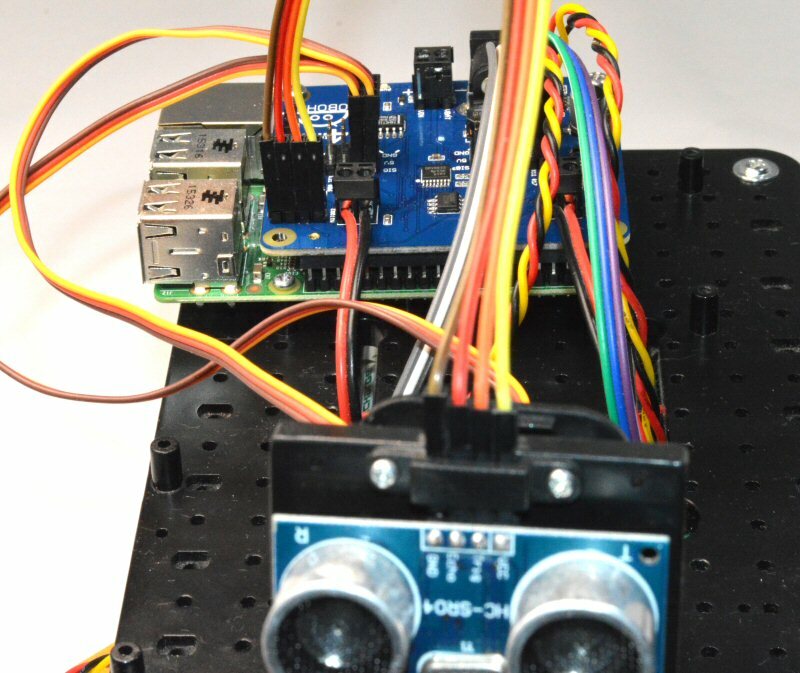 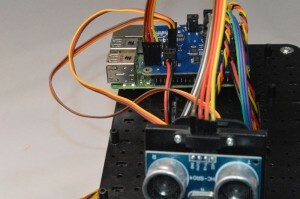 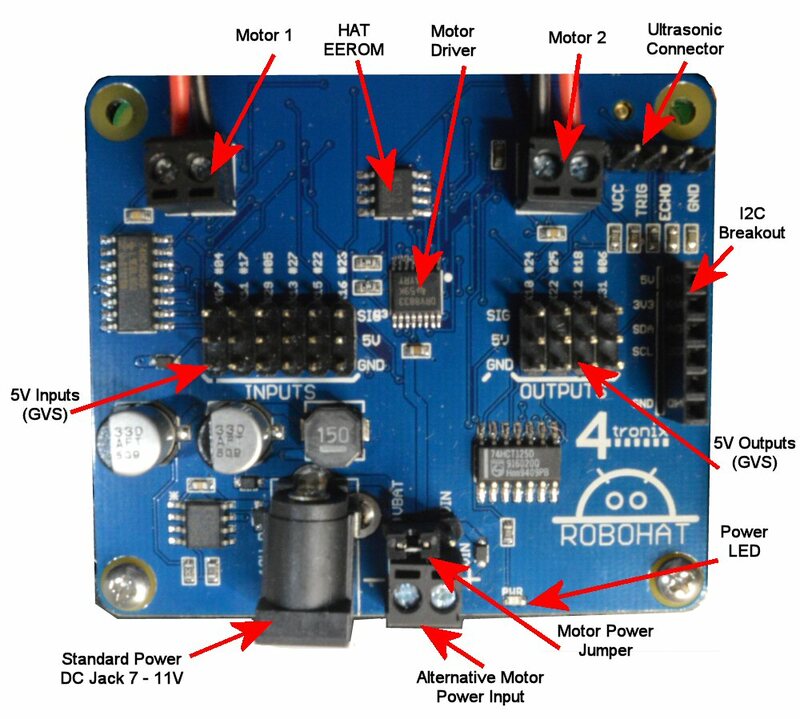 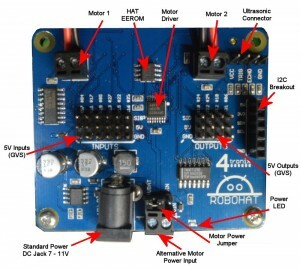 Then plug the RoboHAT onto the Raspberry Pi. Plug the Black/White cable with the DC Jack into the left-most pins on the switch PCB on Initio and the DC Jack end into the RoboHAT as shown above. 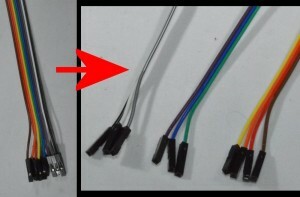 There will be a spare cable with Red and Black wires. 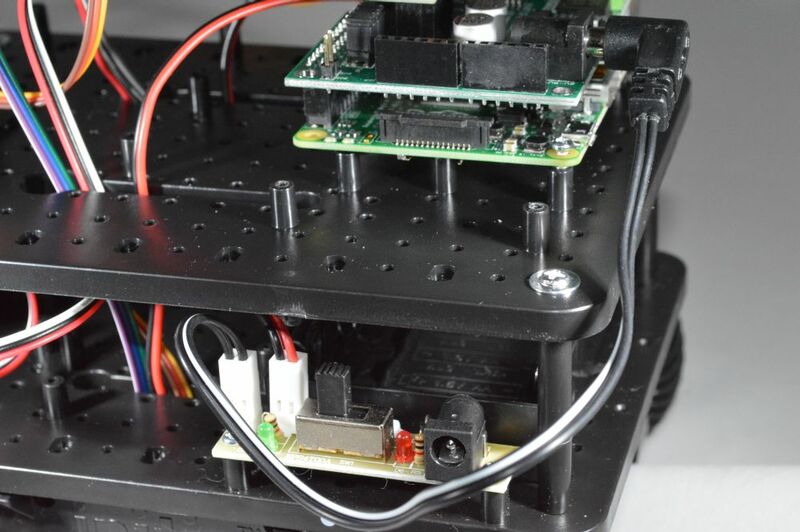 This is not required for the Raspberry Pi build and should be removed so the ends don’t short. Check all the wiring again very carefully, then now is a good time to see if the Pi powers up and you can control the motors. 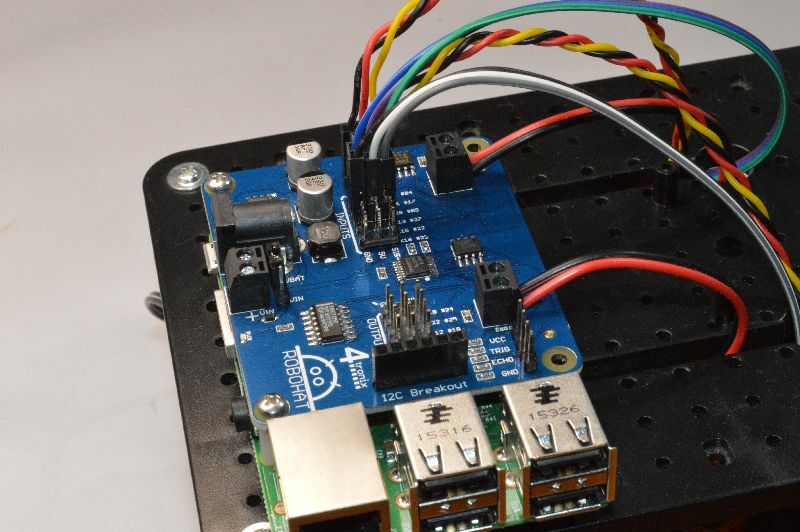 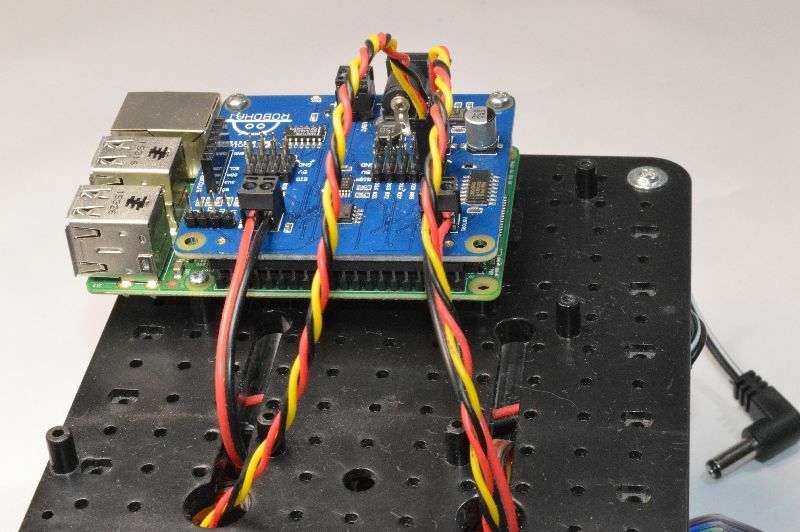 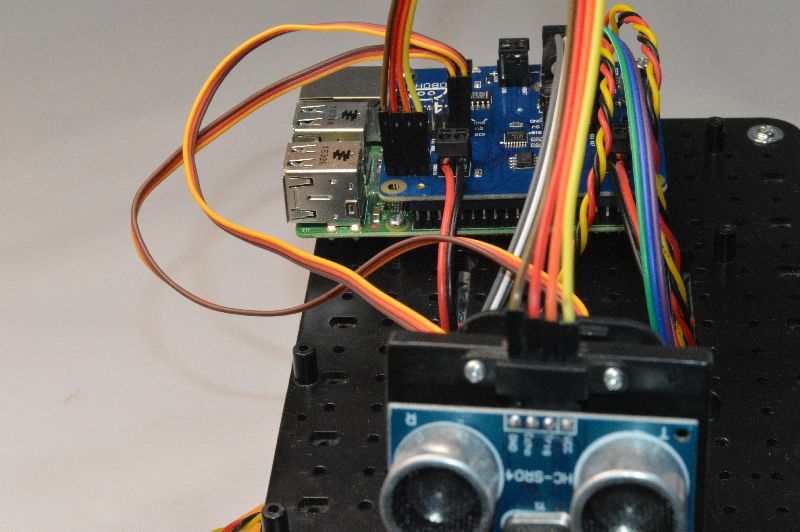 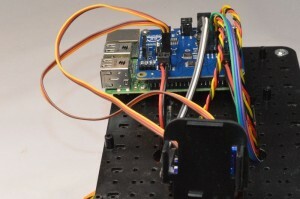 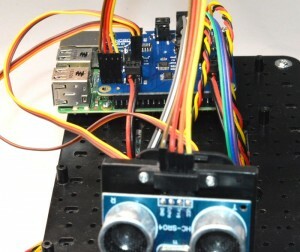 Connect a monitor, keyboard and mouse to the Raspberry Pi, plug in your SD card and switch on. 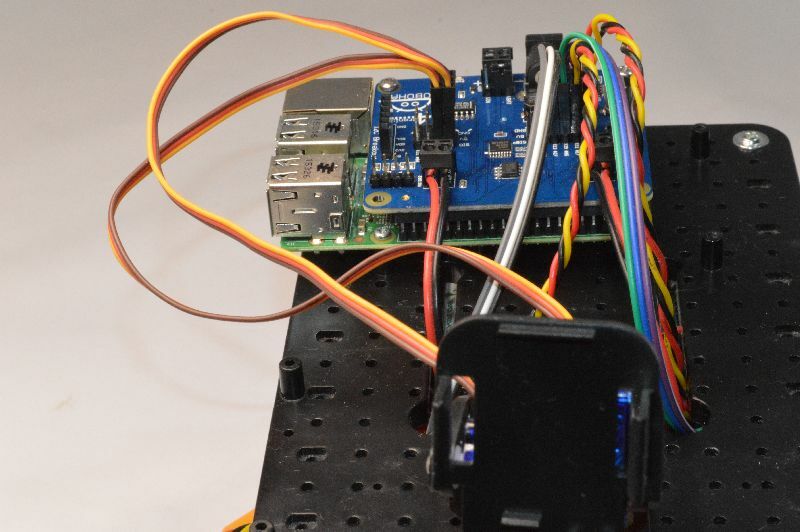 The green light near the On/Off switch should turn on, the LEDs on the Pi should start flashing and the booting sequence should appear on the monitor. If not, switch off and double check the wiring. 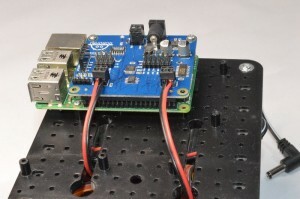 Instead of using the batteries, you can plug a micro-USB cable directly into the connector on the Pi. 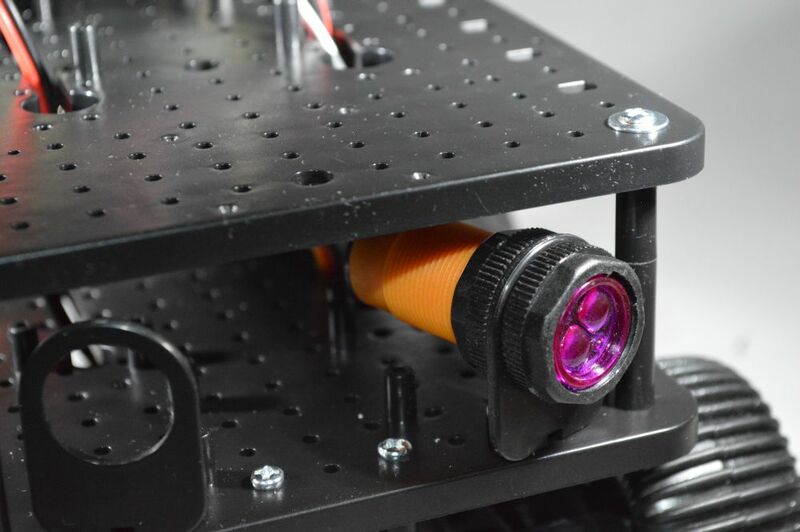 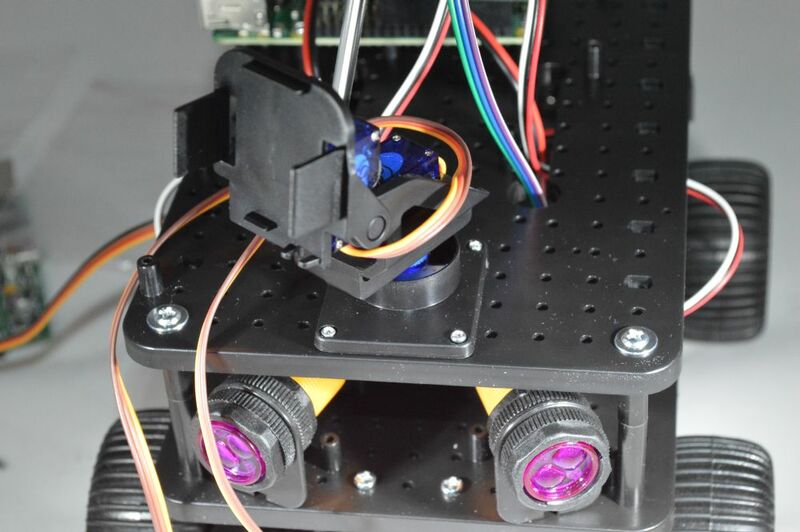 This is an excellent way to get started and allows you to test everything (except the motors, which may turn but only slowly) without using batteries. 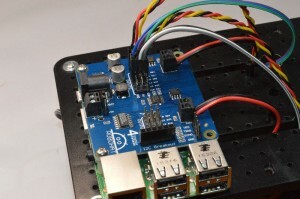 ** Note some sensors have the pins in order 5V, Signal, Gnd; other have them in order Signal, 5V, Gnd – make sure you know which wire colour is connected to which. 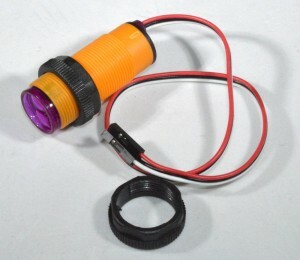 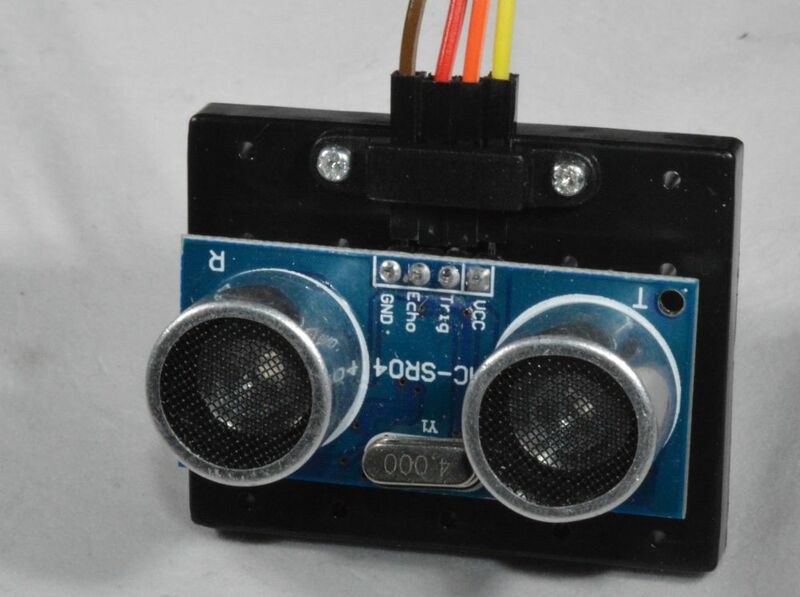 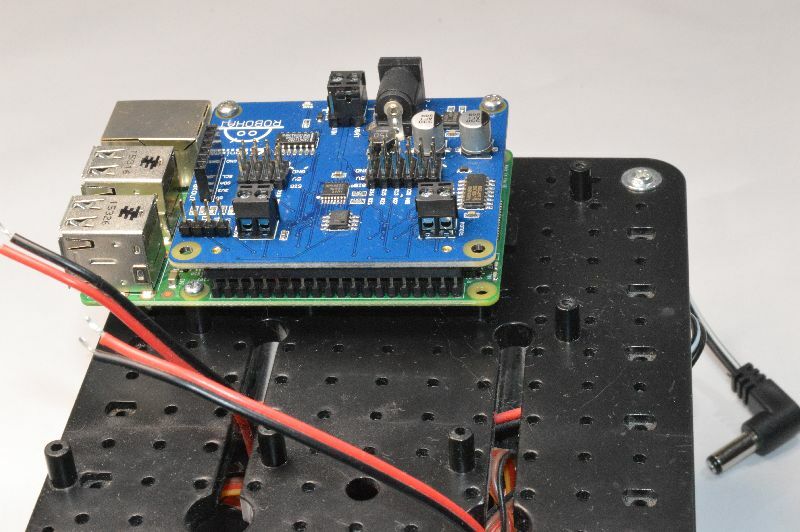 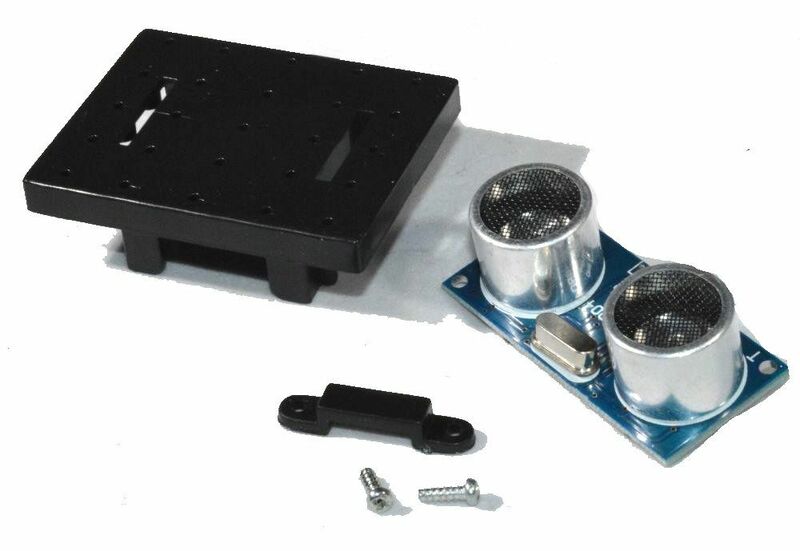 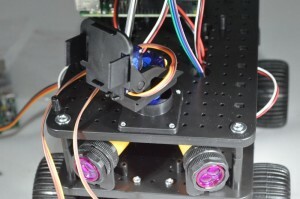 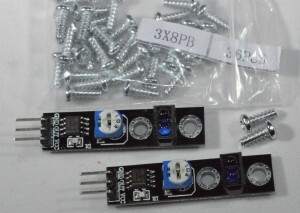 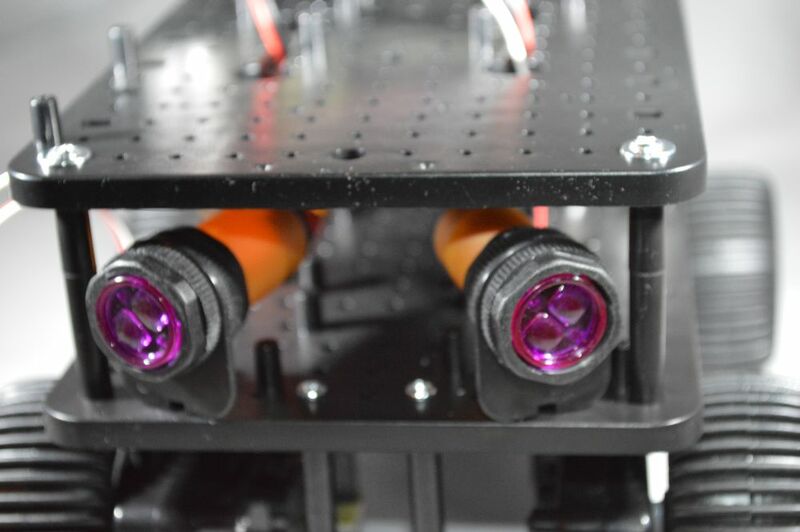 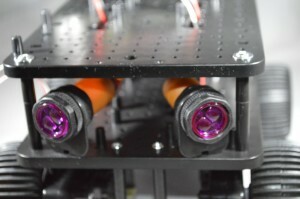 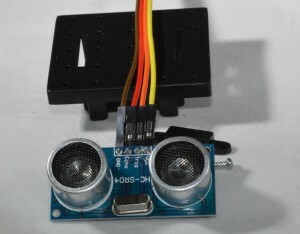 NOTE: More recent kits use a specially purchased ultrasonic sensor which has the connection pins at the front, instead of at the rear as shown below. If you have one of these, then simply use 2 small screws (included) to fit the sensor securely to the mounting plate. If your connection pins are at the back, please follow the instructions below. 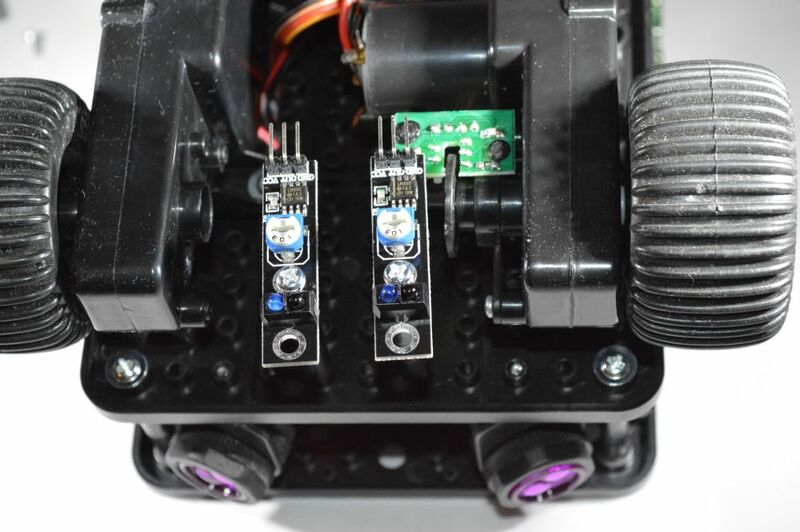 The wiring is the same in either case. The main build of your Ultimate Initio Kit for the Raspberry Pi is now complete. 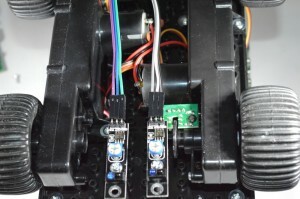 Note that the wheel sensors require additional code to operate properly that is not included in the python library. It is recommended that you do not fit these until you are familiar with the operation of the rest of the robot. 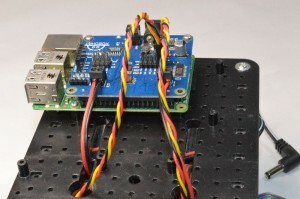 See the bottom of this page for software library and downloads.